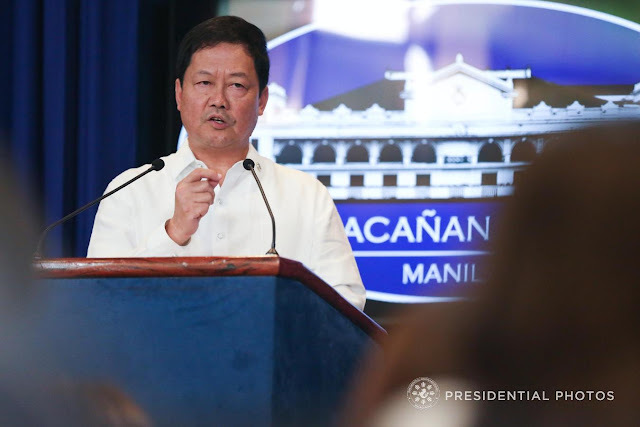 MANILA – The Department of Justice (DOJ) would not allow itself to be used as a weapon against the opposition, Justice Secretary Menardo Guevarra said Wednesday. Guevarra made the assurance during the Senate hearing of the proposed 2019 budget of the DOJ after opposition Senator Antonio Trillanes IV urged the department not to be used for partisan politics. “I believe that the ultimate manifestation that we are on the road to being a developed country is the strength of our institutions, foremost of which is our judiciary,” Trillanes said. “Your department is very powerful, you are the instrument of dispensing justice, sadly in the wrong hands it could be used also as an instrument of injustice,” he added. Trillanes said he believes that the cases filed against him and Senator Leila de Lima are "wrong" and the DOJ should have the moral courage to say no if they think that the orders given to them are unlawful. “I may be put to jail because of a missing application form. Let me be the last casualty. I hope you can give your word that you will stand up for justice especially for the ordinary people,” he said. “I completely agree with you senator that the DOJ should not be a weapon to persecute political opponents,” Guevarra told the lawmaker. “Since the time that I assumed as Secretary of Justice, I have always made it a point for the Department to observe the rule of law and to base all of its actions on the available evidence and nothing else,” he said. However, Guevarra said he could not comment on Trillanes’ and de Lima’s cases. Trillanes is facing rebellion and coup d’etat charges before two Makati Regional Trial Courts after President Rodrigo Duterte voided his amnesty granted by the previous administration. The DOJ filed an urgent ex-parte motion asking the trial courts to issue a hold departure order and an alias warrant of arrest following the issuance of Duterte’s Proclamation No. 572 which declared as void “ab initio” (from the start) the Trillanes’ amnesty for his alleged failure with the basic requirement of filing an application for an amnesty and an admission of guilt. The DOJ said with the amnesty declared as void from the beginning, the dismissal of the cases by virtue of his amnesty is also void. Upon consideration, Makati RTC Branch 150 issued a warrant for his arrest but the opposition lawmaker was able to avoid detention by posting a PHP200,000 bail set by the court for his temporary liberty. Trillanes is still awaiting the decision of RTC Branch 148 on his coup d’etat case which is a non-bailable offense. Meanwhile, de Lima is in detention on drug charges. Trillanes insisted that he complied with all the requirements to qualify for the amnesty program while de Lima denies the charges against her. “I am sorry that I cannot make any comment on these matters because these are sub judice right now. The courts have already taken cognizance of these cases and it will be highly improper for me to make a comment on these cases,” Guevarra said.